We serve the working poor or those on a fixed income folks who have a job at the low end of the ladder, working hard to make ends meet for themselves and their families. Since 1991, Molly’s Soup Kitchen has been open to anyone and everyone that finds themselves in need of a hot meal and a safe place to enjoy it. We have no requirements for those joining the evening meal. Homeless individuals and families, the working poor, those on a fixed income, or anyone who simply needs a place to sit and “break bread” are welcome. The meal goes beyond soup. The idea is to help people nourish their bodies and their souls by making some connections with others and with God. Often we can identify those who need a specific service and link them to that service. Molly Ministries helps our struggling neighbors back to their feet. Our services are designed to revitalize self-sufficiency and independence so our guests can get their lives back on track. Staff and caring volunteers offer nourishing meals Monday through Friday at 4:30 PM. A meal isn’t always what a family needs. Some folks need food to keep their family going through the tough times. We can provide people with bags of nourishing groceries for them to prepare at home. Our food distribution takes place three times a week and we ask individuals to partake of this only once a week. We are aware that we need to be good stewards of the resources provided to us, and that means working to meet the needs of as many as we can with the resources we have. We annually run a Turkey Drive at Thanksgiving and another drive for Christmas. At Thanksgiving we work very hard with local media to collect enough turkeys and other foodstuffs to provide a Thanksgiving dinner for everyone in need. At Christmas we solicit presents through a Giving Tree so that all families can enjoy a Christmas celebration and enjoy a Christmas dinner. Because hunger doesn’t just happen during the holidays, we also participate in the Annual Postal Workers Food Drive each May. When we find our reserves running low, we may put out an appeal to the community for additional foods to re-stock our inventory. Molly Ministries operates a Food Bank which supplies other food providers and soup kitchens throughout Central Maine. These supplies are free as they are needed and available. Molly accepts food donations to support the Soup Kitchen and Food Pantry. 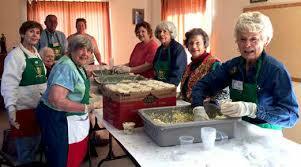 Molly Ministries feeds more than 100 meals each night, serving meals to 3,000 people annually. Each week we provide 180 individuals and families with enough groceries for three or four meals. Our food services comprise a vital piece of our much larger vision. Molly Ministries works to create a community where everyone has food, clothing, housing, and an opportunity to support themselves. We invite you to join us in making this vision a reality.